WATERFRONT LOT in beautiful Shadow Lakes! Huge oaks will shade your home from the western sun. Ideal for circular driveway in front. Enjoy the stocked lake at your back door. Min. 2200 s.f. No time limit to build. 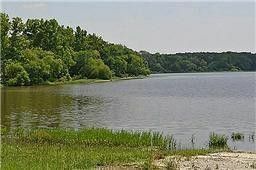 Also, enjoy the 200 acre community lake down street, swimming pool, hike and bike trails, sports field, and only 30 min. to Dallas. Owner-Broker. Owner financing avail. Directions: TAKE EXIT 512 off I-20 east of Dallas, go over freeway, left on frontage road. Right into Shadow Lakes, 2nd left, next right.